I normally update the various articles on the site when something new comes along. In this case, I had several new photos and other discoveries accumulating within the last 2 years, and finally got around to adding them all to the multiple Maccaferri presentation. Michael Simmons kindly donated a page from a 1929 Columbia Recordings catalog - the included new Maccaferri image has been added to Maccaferri Iconography, his Player Feature, and the Harp Guitar study. The entire catalog page is accessible on the Members Only 78 Recordings page. nella prima metà del Novecento, curated by Simona Boni. 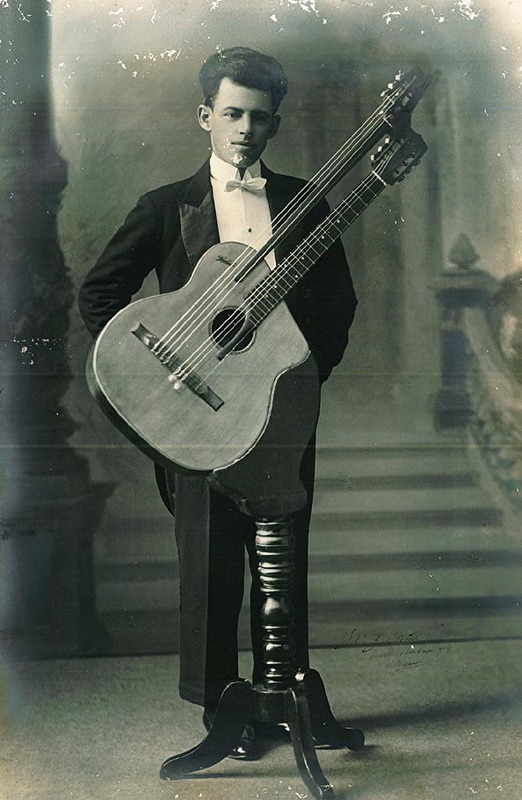 This shows Federico Galimberti - who we already knew used a dual-arm Mozzani harp guitar - this time with a Maccaferri Type 1 harp guitar. This resides on the Macc Iconography page. On the Members Only Harp Guitar study page, I've now added images of the only known extant specimen of the Type 1 Maccaferri harp guitar that I am aware of (with 5, rather than the typical 3, sub-basses). It is from the 2009 Mozzani book by Giovanni Intelisano, and courtesy of Lorenzo Frignani. Harpguitars.net Members and Non-Members alike would do well to obtain this incredible book. On The Maestro Plays His Mentor's chapter on this page, I added a short, but interesting 1983 photo article from Classical Guitar (donated by Michael Simmons) about Maccaferri restoring his Mozzani harp guitars (plus pics of him with his "silent" and "portable" practice guitars). Curiously, the 5th Mozzani is not shown - perhaps it was still in disrepair. This is the one shown above, that was sold to Scott Chinery (as all were) by Maccaferri's widow, then hung in E-Guitars San Rafael, CA store for a couple years, purchased by my friend Benoît Meulle-Stef in Brussels, and recently sold to a player in New York (full circle!). Also added to this same chapter and at the end of the Player Feature is another 1950's photo of Maccaferri with a different Mozzani guitar (courtesy of Michael Wright), along with the above color photo (courtesy of John Monteleone). I rewrote the Player Feature paragraphs that explored the "mystery 7-string" harp guitar, based on the recent Type 7 specimen discovery. And finally, since I had nowhere else to put it, I did a short "Sidebar" on a couple of possible harp guitars in Django Reinhardt's life in the Player Feature. Thanks to Michael Dregni, whose books I also highly recommend. Long live the memory of Mario Maccaferri!